I came to the realization that I do not like the cowl scoop on my car anymore. It's big enough where I could run over a kid/moose and not realize it. I'm looking for ideas to protect my air cleaner from the element. It sticks passed the hood about 1" or so. I have been thinking about an aftermarket ram air but I'm unsure how much flow it can pass thru. 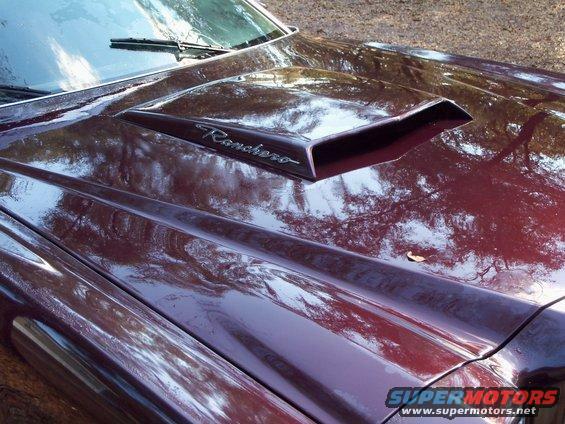 I really wanted a cowl scoop thinner and much wider but couldn't find one. So, if you don't mind, show me your hoods. whatever scoop you get, it should fit the hood and the car in overall size which means it needs to be a decent sized scoop. 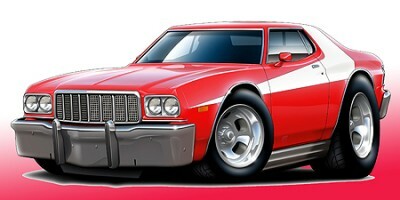 I have seen the early cobra jet scoops and they just look so small on our cars, same for the shaker style scoops. 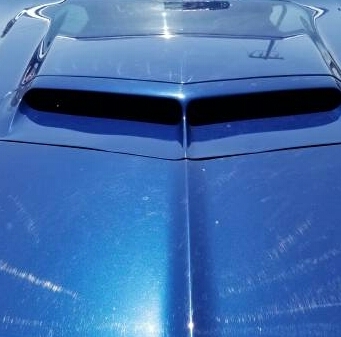 You should be able to find a lower cowl scoop if thats what you really like, 67-69 camaro would eb a good choice as it has the same center peak as our cars. I'm sitting low indeed, I can't raise the seat anymore or my helmet will be touching the roof. 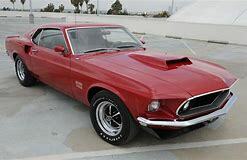 I've been looking at late mustang scoops, mopar scoops. 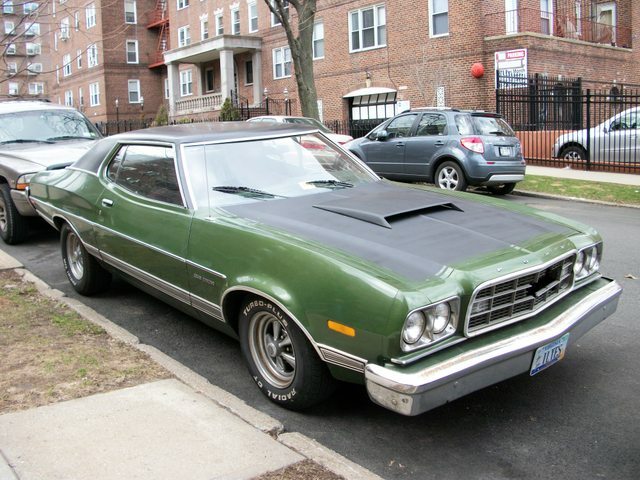 I need to see them on a torino hood to know what looks good to me. those things are handy for all kinds of uses, i have a bunch of them! 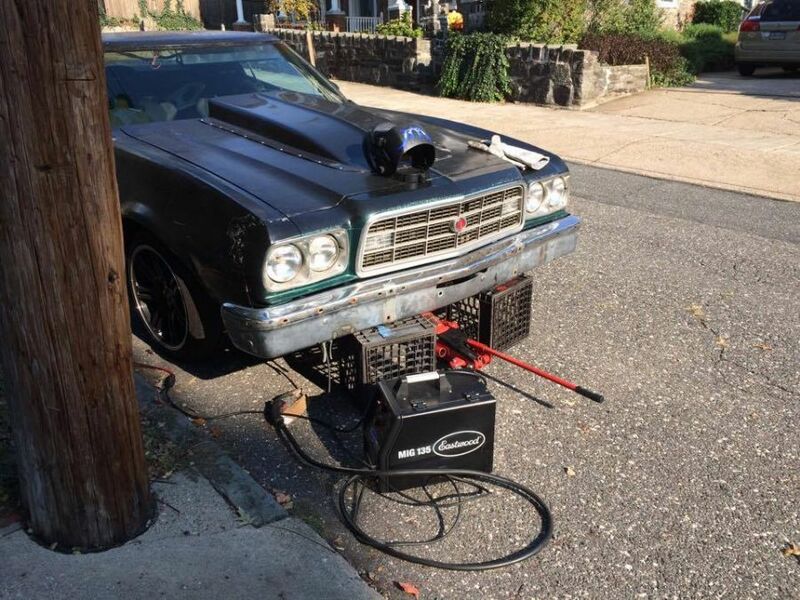 Was hoping they weren't being used as jackstands. Is that a 70 mustang scoop on the green one? I was just trying to hold the bumper in place so I could attach it to the car. It's in there temporarily until I decided to cut it up ad shrink it to fit the body. 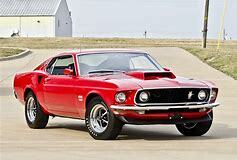 I do not remember what year mustang I got the scoop from. 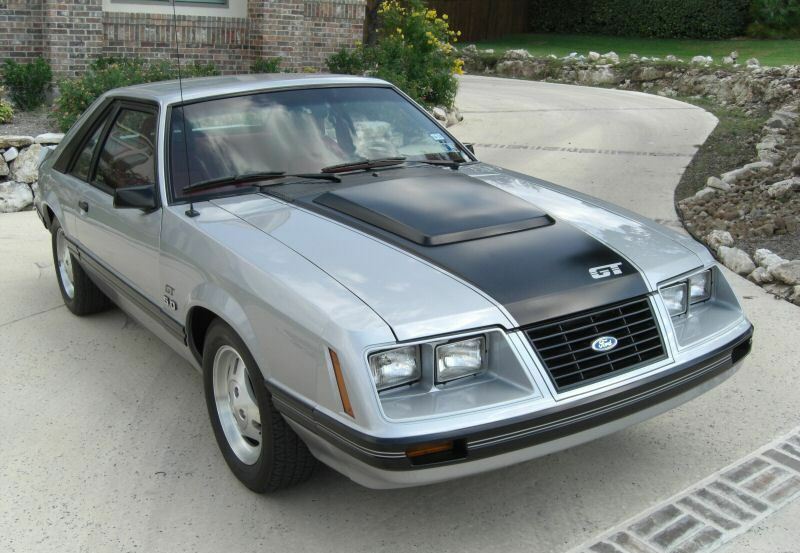 The scoop is from a 1982 mustang gt. 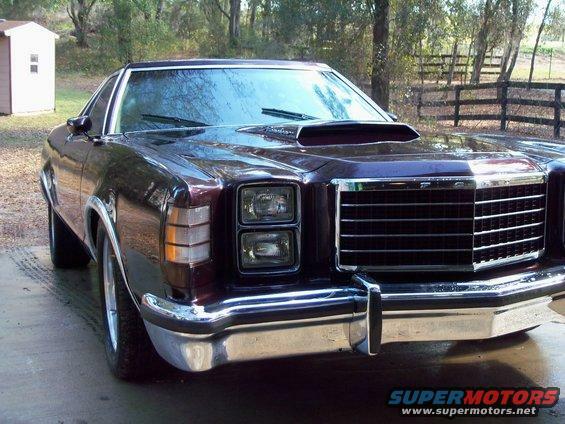 How about an '83 Mustang GT hood scoop? Available only on the '83. 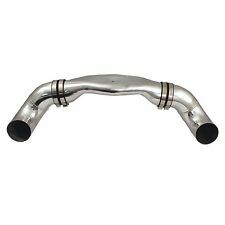 It has the look of a rear facing cowl induction scoop. It's little smaller and less obtrusive. Potentially, you could turn it around the other way, depending on the look you want. Here's a link to a completed ebay auction. It would be kinda hard to find one. 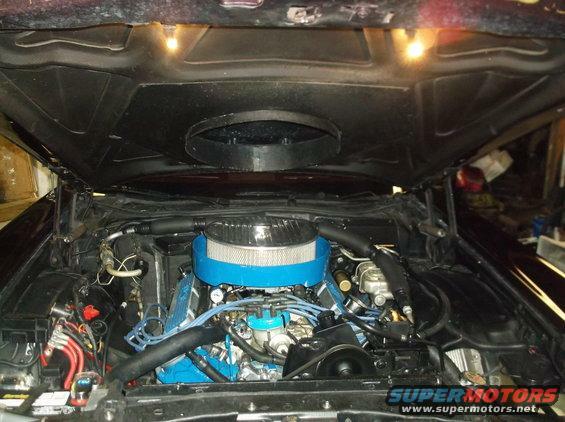 The 1969 mustang boss 429's came with the scoop in the pictures below. 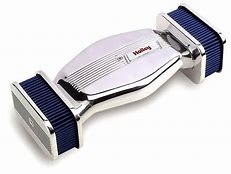 Holley makes a low profile air cleaner like in the picture below. There are also several other types of low profile air cleaners available, such as in the picture below. That cougar scoop looks good. I like that it has the center line to match the hood. 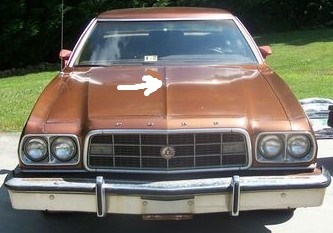 The center line of the montego gt hood does not appear to offer any more hood clearance than the gran torino hood has. 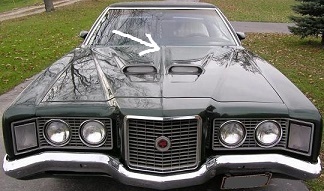 The montego gt hood has a large space cut out of it underneath to fit a plenum on it. That might give it extra room. 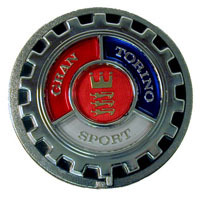 that should make 1" ?